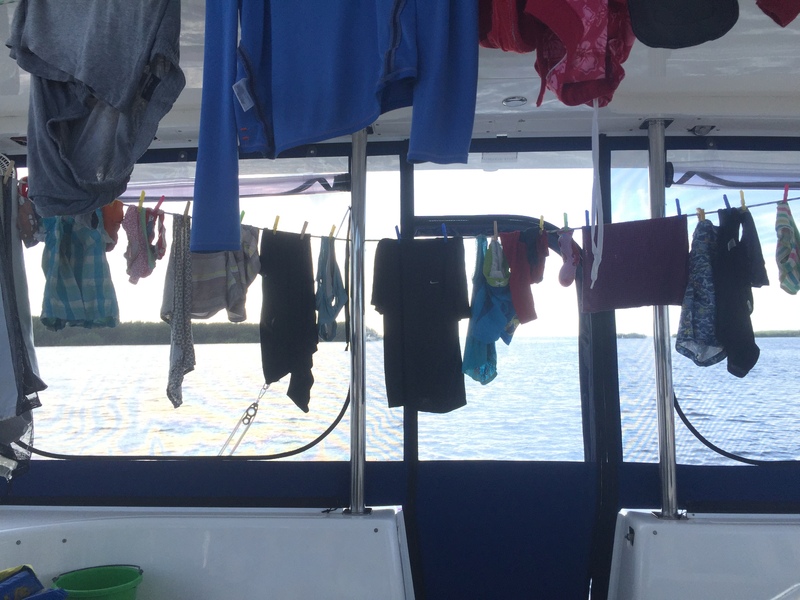 This blog post described a few of the lessons I’ve learned while doing laundry on a boat. With six people aboard and one still in nighttime training pants, I do lots of laundry. But, I have lots to learn. We are just starting out as cruisers. We do not have a washing machine on SV Aphrodite. I wash everything by hand, including sheets, towels and clothing. I should point out that this rootsy hand washing thing is new to me. Before we moved to our boat we had two sets of washing machines. They were going constantly. When we arrived in Florida we stayed at a marina. And, we were docked mere steps away from the laundry machines. But, after leaving the sanctuary of a Marina I began to do laundry by hand. I researched other methods, including buying a washing/drying combination machine. But, the capacity of the machines is quite small. Given the quantity of laundry that we produce, it seemed to make most sense to use one of the 3 foot bathtubs that we have aboard. I use a plastic surgical brush to scrub our clothes clean. Here is a picture of us in our first few days of cruising – looking like hillbillies in a very well-off canal-lined neighborhood in Naples, Florida. Naples is home to many celebrities with palatial, waterfront homes. We anchored in Naples for one night. While I saw the funny side of hanging our laundry out to dry – the contrast between the grandeur and the mundane – my husband, Rick, was less keen on the potential for spectacle. Still, we motored along with our clothing swinging in the breeze, as we looked for a place to anchor. A few days later, on a blustery day, and still very new to doing laundry at sea – we lost three towels while sailing. They blew off the guard rails. That led us to learn lesson 1. When I have wet laundry on a wet or sailing day, I hang it on a line inside the cockpit cover. Laundry hanging on lines in our cockpit. On occasion, the cockpit gets misty with condensation. The entire area either smells fresh like laundry soap or like an old wet swimsuit, depending on how fast I can get the clothing on the line. Sometimes we have more laundry than line space. Sometimes it’s very windy. The following photo shows how our sheets behave when our boat is anchored in the wind. I use a combination of plastic and metal clamps to hold large items like bed sheets and towels. Metal clamps leave rust stains on our boat and clothing. Tonight, I mistimed the weather – thought a storm would blow over – and found myself instead getting slapped with rain-soaked bedding. Here is a picture of me taking in our laundry in a storm. Me taking in our rain-soaked laundry during tonight’s thunderstorm. I have lots to learn about anticipating weather on the water. Currently, I do laundry almost every day. This takes a lot of water. For me, fresh laundry is a hard habit to break. I tend not to wear my clothes more than once. I can’t bear the smell of stale deodorant. I like to start the day smelling clean. I don’t insist that my kids wear clothing marked with the previous days’ food. Our clothes are washed more often than I shower. Sometimes the quantity of laundry gets ahead of me. Here is a picture of a few days’ worth of laundry as I waited for a taxi in Tavernier, Florida headed for the laundromat. About four days’ worth of laundry generated by our family of six on the SV Aphrodite. We are just beginning our liveaboard adventure. Ask me in six months what we are doing with our laundry and I may have abandoned my philosophy of clean and answer you quite differently in a food-stained t-shirt. I hope it doesn’t take you 6 months to abandon your philosophy of clean. Life is too short to not wear dirty clothes!! Ghostbusters: Bill Murray explaining to Sigourney Weaver the various degrees of “clean”.